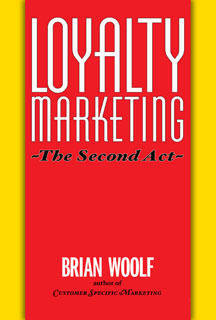 Loyalty Marketing: The Second Act shows what's required for success today in loyalty marketing. What are global best practices? Why have some programs failed? What are the common denominators of success? Are some programs inherently better than others? What keeps customers interested in the program? Why don't all retailers embrace loyalty marketing? How deeply should a loyalty program permeate a company? The lessons of this book, using retailing examples, has direct relevance to both online and offline businesses across all sectors. Its purpose is to help you follow in the footsteps of the best, and avoid the missteps of the rest. "​Brian has conveyed the importance and power of building real loyalty with the consumer. His frequent use of case studies spanning several industries illustrates and quantifies the benefits of building an effective loyalty program and putting it to work in even the most competitive and mature of markets. " "This book has something for everyone, from those just beginning to develop a loyalty program, to companies that have practiced it for years. These insights will explain what it takes to succeed with today's savvy consumer." Randy Tidmore, Customer Information Manager, BI-LO Inc.
"One thing you will learn from Mr. Woolf is "it's much more important to reach the customers who count, rather than counting the customers you reach! ​"